This entry was posted in Uncategorized on June 28, 2014 by IAM&AW Local 24. If you want to be notified by email of Local 24 news please send the webmaster your email address using the “contact” link at the bottom of our main website page, just hit home and scroll to the bottom for the link. Most of us have had our work emails changed recently so please update your information if you want to keep recieving updates. You can also join our Facebook page by clicking the link on our website. This entry was posted in Uncategorized on June 13, 2014 by IAM&AW Local 24. There has been some concern amongst our members concerning a new respiratory virus that has appeared in the middle east, Middle East Respiratory Syndrome-Coronavirus or MERS. Dyncorp has put out information to its employees concerning the MERS threat and has given us permission to post it to our members. Recent reports have highlighted a relatively new virus that has impacted Saudi Arabia* over the past two years: the Middle East Respiratory Syndrome-Coronavirus (MERS). Because DI is a global operation with personnel who travel frequently, familiarizing yourself with the signs of and facts about global health issues is always important. Although the total number of people infected with MERS remains relatively low, all DI personnel should review the basic facts and know where to go for information. Who Is At Risk of Contracting MERS? According to the World Health Organization (WHO),people who are immune-compromised, or have a pre-existing medical condition that could affect the immune system, should take care when visiting farms, barns, marketplaces, or other settings with livestock/non-household animals. MERS can spread between people who are in very close contact; it does not, however, seem to spread as easily as SARS or many strains of the flu. In general, Americans visiting Saudi Arabia who are not working in a health care setting or with livestock/non-household animals are considered to be at very low risk for exposure to MERS. Note: Many otherwise healthy, young or middle aged individuals who tested positive for the virus have not experienced any symptoms, or suffered from only mild respiratory illness, recovering without incident.
. Wash your hands often with soap and water for 20 seconds, and help young children do the same. If soap and water are not available, use an alcohol-based hand sanitizer.
. Cover your nose and mouth with a tissue when you cough or sneeze, and then throw the tissue in the trash.
. Avoid touching your eyes, nose, and mouth with unwashed hands.
. Avoid personal contact, such as kissing, or sharing cups or eating utensils, with sick people.
. Clean and disinfect frequently touched surfaces such as toys and doorknobs. Where Can I Find More Information on MERS? This information is provided for general awareness only; DI does not provide medical advice, nor is the Company making a medical inquiry with this communication. If you have additional questions, please contact DI Care’s Mike Warren <mailto:Michael.Warren@dyn-intl.com> . 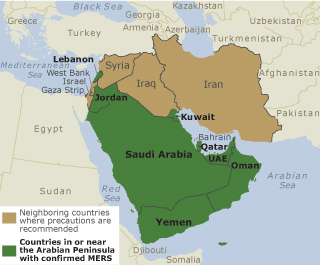 *Per the Center for Disease Control’s website; Cases of MERS (Middle East Respiratory Syndrome) have been identified in multiple countries in the Arabian Peninsula. Countries considered in the Arabian Peninsula and neighboring include: Bahrain; Iraq; Iran; Israel, the West Bank, and Gaza; Jordan; Kuwait; Lebanon; Oman; Qatar; Saudi Arabia; Syria; the United Arab Emirates (UAE); and Yemen. This entry was posted in Uncategorized on June 12, 2014 by IAM&AW Local 24.